For the love of my Oakley shades, I decided to try contact lenses. I love my Oakley prescription glasses too. But I think they need some refitting since they leave line marks on my cheeks. (Since I have high cheekbones, haha, or is my face getting plumper? Oh no! Then, bad fitting is it! Hah.) It pains me to buy a new pair for now. So instead, I tried getting fitted with contact lenses. Flex Wear Radiance 2 in Sea Blue. and Acuvue Clear Contact Lenses. It's not a walk in the park, or a plug-and-play kind of happening. It takes time to get used to. Here's my beginner's/new user's guide to wearing contact lenses. The Flex Wear is from Executive Optical. The nice thing about EO is that eye check up is free. I also got to try the handful of contact lenses (just made sure to clean them thoroughly), different colors, just so I can get a feel. I know now that I can only go for a diameter of 14.00. I cannot go for anything bigger because I can feel the edge, no doll eyes for me. The whole exercise was very helpful. Although the whole ordeal of trying out contact lenses during that time was very uncomfortable. My eyes were teary, red and stinging. But for the love of beauty, it's now or never. Since I'll wear colored contacts anyhow, I went for the Sea Blue. For the photo-heavy spots, I tried wearing them. We stayed three weeks, but I wore them in just four occasions/days, first was in San Francisco city tour, second was in Las Vegas, third was Chicago, and lastly was in Wisconsin Dells. When we get back, I wore them one last time in our last day in Hong Kong. I thought that perhaps I needed another brand, something more branded perhaps (hah. sorry, my brand consciousness prevailing), thinner. 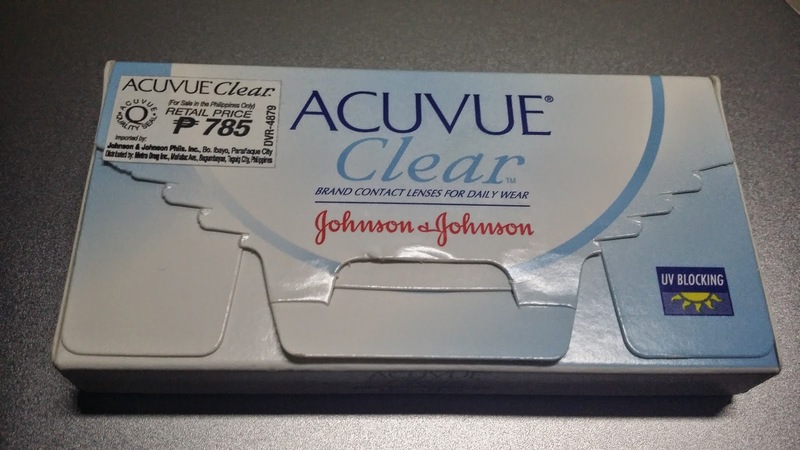 I ended up getting Acuvue. A doctor answered some of my questions...hard contact lenses are more breathable (for the eyes), but soft contact lenses offers more comfort. I went for comfort. 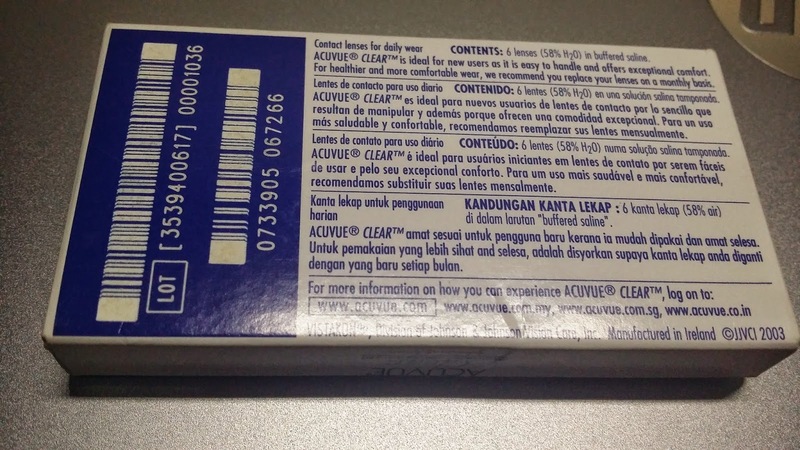 Acuvue Monthly Disposable Contact Lenses. It has three pairs, same grade/power, subtle blue tint for easier handling, good for three months at one month per pair. I like the part where it says ideal for new users, and offers exceptional comfort. I'm sold. But truly, patience is a virtue. I didn't had that last time. After googling, I learned that 3-7 days discomfort with contact lenses for a new user is common. I just had to weather the adjustment period, and all will be well. And it did, indeed! Try and try. 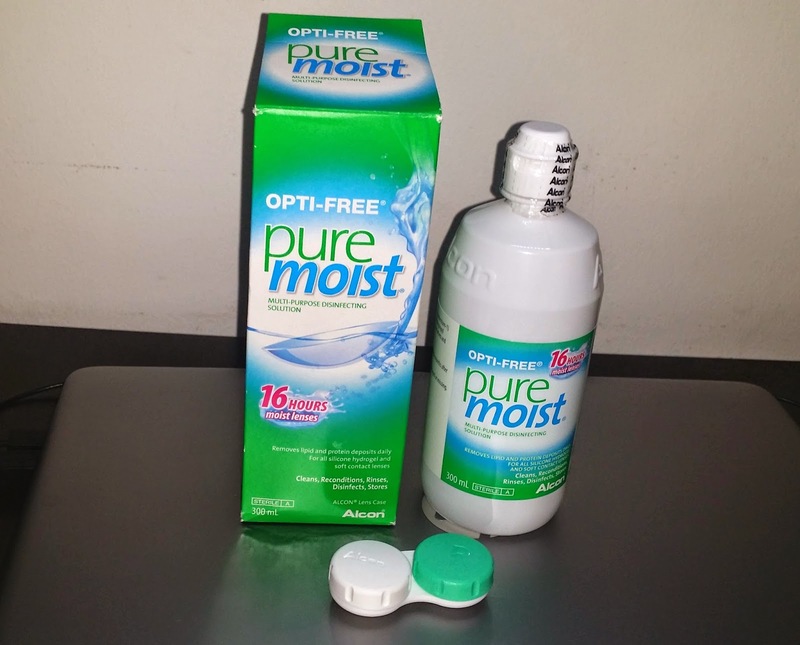 Alcon Pure Moist, Alcon Opti-Tears for Comfort Drops, Lens Flo and Cylean Executive Optical House Brands, Bausch + Lomb ReNu Fresh Multi-purpose Solution. More stuff on my dresser. More time needed to get ready for work. Good luck. I'm almost out of B+L ReNu, I'm inclined to keep using this brand. I found trial sizes of Alcon and ReNu in a Target branch in Chicago. I couldn't find these in West Covina Target. I ended up getting a ReNu in an optical shop in Robinson's Galleria, I forgot which shop. Do you have a preferred brand in mind? Please do tell. Today, I initially intended to buy the full size of ReNu, but apparently Pure Moist is nicer because of the 16-hr reinforced moisture. The full size costs Php 330 per bottle comes with a free case, ReNu cost Php 200+. As a beginner, I always bring the comfort drops with me. I even bring a solution and a case just in case I feel the need to remove them in the middle of the day. Without compromise, I diligently follow the care guide. 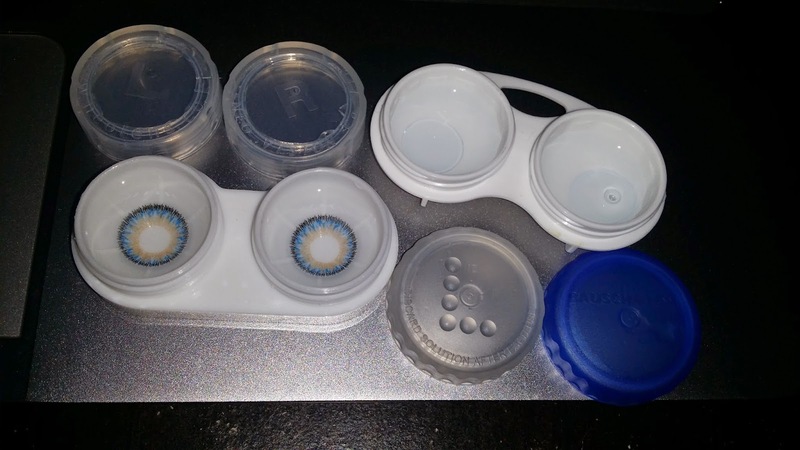 That includes cleaning and drying the contact lenses keepers when not in use, and filling up fully the case with cleaning solution when storing the contact lenses. I'm not an expert contact lenses wearer yet, I will get there. But I live with my mom who was a contact lenses wearer for life until recently, so seeing her how she did it then came in handy. By the way, after getting used to Acuvue, I'm alternately using colored lenses, I can hardly feel them, and that's very good! Hello Blue Eyes...purple, blue, green, brown, gray, possibilities are endless! Hah. But, Acuvue pairs are more softer, and yes, more comfortable, leaving a barely-there feel. There are other colored lenses, I hear Fresh Look are as comfortable. Chic & Sassy Tip 1: For a new user, my biggest issue was to know which is the right side. I thought that if I got them wrong, I can tell anyway because they will be blurry somehow. They will not. You will know it's the wrong side when you feel the edges. It will be unbearably ouchy. Chic & Sassy Tip 2: Removing is easy. Putting them on was the exciting part. What usually triggered teary, red eyes when I started was I had to do it several tries...pulling and tagging my upper and lower eyelids several times. I'm almost getting there, one attempt per eye a la plug and play. Patience is a virtue. Relax. Smile. By the way, I put them on after my makeup is complete. I take them out prior to my nightly skin care routine. 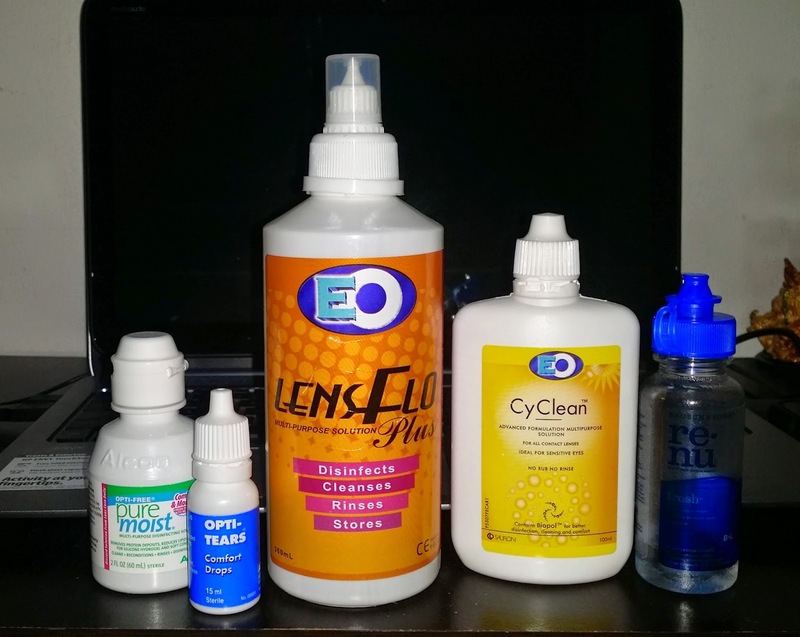 Chic & Sassy Tip 3: Most recent update and tip, please click my favorite contact lens solution and case post here. On my precious Oakley Prescription Glasses, you are my stay-at-home eyewear. For the love of Oakley Shades, being on contact lenses will allow me to be more adventurous on my sunnies, the more, the merrier. FOTD on Acuvue. Hello Blue Eyes! Under the sun/light, they're noticeable, and my eyes is rounder and fuller. But the shade is still relatively low-key, methinks. Haha. I can use green or purple. Let's try. thanks for the tip,i really have a hard time putting contact lens..